Ohio Department of Aging & Ohio Department of Medicaid, and other agency leaders visit Countryview of Sunbury! 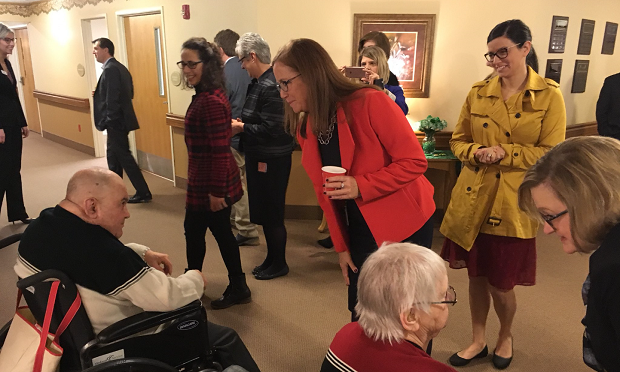 Ohio Medicaid Director, Barbara Sears, and Department of Aging Director, Bev Laubert, along with other agency leaders and staff, visited Academy member Country-View of Sunbury this week! Country-View was one stop on a schedule of provider visits related to Governor Kasich's State of the State address. Country-View is a high-quality provider of skilled and long-term care services. At Country-View, the group toured the facility, met with residents, and discussed the effort Country-View staff put forth to maintain high-quality services. Different ways of awarding quality services were also discussed during the visit. Thank you to the Country View staff for welcoming our guests and creating a wonderful visit!